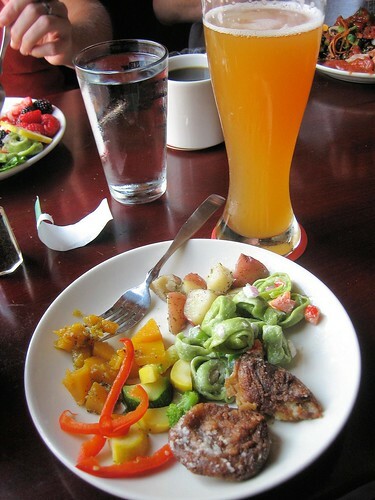 Pic(k) of the Week: Brunch with hefeweizen. Brunch with hefeweizen, at the Great Dane Brewpub, in Madison, Wisconsin (at its Hilldale neighborhood location). Great Dane is a venerable upper midwest 'craft' beer institution. Its original downtown location opened in 1994, and is still thriving. Pairing food with beer really isn't complicated, and shouldn't be. Just enjoy it (although I would recommend a well-made hefeweizen (as this was) as wonderful refreshment for morning brunch). 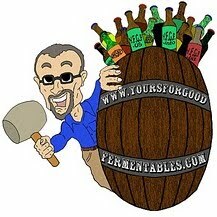 Marty Nachel, author of Beer For Dummies, recently wrote a useful guide to beer-with-food-pairing, online at Jollity Magazine (Part I and Part II). Calm. To soothe or diminish spicy heat or intense flavors. Cut. To mitigate or minimize richness or fattiness. Contrast. To emphasize dissimilarities such as sweet-and-sour or sweet-and-salty. Complement. To marry common or similar flavors. There is also a lesser-known “Fifth C” that is somewhat unique to beer (it’s a benefit wine can’t provide): Cleansing plays a default role in beer and food pairing because beer is carbonated. The tingly carbon dioxide bubbles help to scrub the palate of heavy or cloying flavors and keep your taste buds lively. The photo itself is a blast from the (2009) past. It was taken on 9 August 2009, the morning after that year's Great Taste of The Midwest. 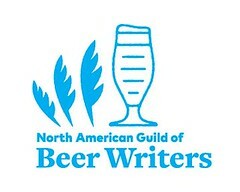 The GTMW is North America's second longest-running 'craft' beer festival, held annually in Madison. This year's iteration is scheduled for 8 August 2015, but has already sold out, as it has every year. Pic(k) of the Week: one in a weekly series of personal photos, usually posted on Saturdays, and often, but not always, with a good fermentable as a subject. Camera: Canon PowerShot SD400.